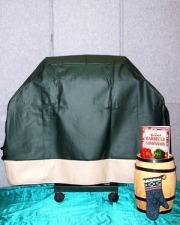 Our Appalachian 2 tone grill cover may just be the one you are looking for in the Grillfitti Grill and BBQ cover category. Lets face it, not everyone wants a design on their grill cover. What is important is that Black is out. No black decks, lawn furniture, awnings or patio furniture, so why have a black grill cover!!! In fact, Black shows the dirt much more from tree pollen and road dirt than any other color available on the market today. The Appalachian has a Hunter Green Body with matching Taupe border....no design The Appalachian will blend in naturally with your outdoor "great room" and living areas. Available in 3 sizes to fit most any grill on the American market today. Medium at 53 inches, Large at 63 inches and Super at 71 inches. All are 38 inches long and 24 inches wide.